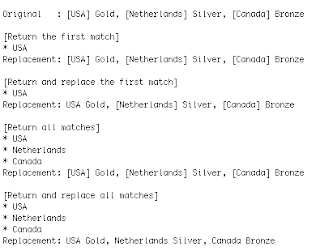 This example works on the string: "[USA] Gold, [Netherlands] Silver, [Canada] Bronze"
It matches/replaces the first country and then all countries. It's not a question whether you should unit test but how much! Unit testing matters because it will make your code more reliable. This is especially true when code needs to be updated as time goes along. Unit testing takes discipline. It is tempting to just hack a result together and use ad-hoc testing. However, by recording these ad-hoc tests in actual unit tests you will be able to run them over and over again. It is not a question of whether you should do unit testing. Rather the question is: "What's the level of detail you are going to do unit testing?". Keep it basic, especially in the beginning. Unit tests are great for diagnostics and make your programming efforts more sustainable in the long run. From personal experience, I can tell you how many times I have quickly build/hacked applications together. Weeks later, when I had to change something basic, this could take hours or even a day because the change I made caused other parts to fail and it was hard to diagnose. Unit testing is a skill that can help you get to the next level as a programmer as well as an organization. It will take effort and persistence but when done in the right amount you should be able to reap benefits in weeks. RawDev has tried to make unit testing as streamlined and easy to do as possible. There are 3 aspects to unit testing in RawDev: (1) a unit test, (2) a component test (the test classes that you will write), and (3) the unit test binary that runs all, some or one unit test. A unit test typically tests either correct output of a function or verifies if the expected exception was raised. In addition one or more asserts can be done after the function was executed. Asserts are typically tests of the object and global state. Don't worry about how results of tests are displayed, I will get to that in the next section. RawDev uses fluid API calls for usability. Let's look at some examples. First a real basic example of a function that calculates the sum of 2 or more inputs. Each test has a title for diagnostics but as we will see later the title will set to the test function that implements the test. The steps of the first test are: set function, set title, set input params, set output params, test function and evaluate results. The second function tests wheter the exception is thrown as expected. The output of any component test (or all tests) is divided into 3 parts: tree view, overall view, and failed test messages. As you can see all tests succeeded except for the "testArray" unit test function of function max in the Util class. Extra information is displayed (including a simple trace) why the test failed. Unit Testing takes discipline. When done at the appropriate amount it will increase productivity and reliability. It is also a great diagnostic tool. RawDev organizes unit tests into component test classes. The runit binary can test one unit test, all unit tests or any component and it's children. 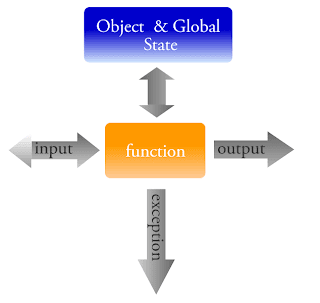 When a function changes the state of the object or global state then multiple assert calls can be made to verify the changed state. For this reason the object or global variables should be accessible publicly or by method. Unit tests are most effective when functions have one specific task. Doing unit testing will actually alter the way you code (this is not a commercial for suits). Although RawDev offers debugging tools, it can be useful to use an IDE with a debugger. 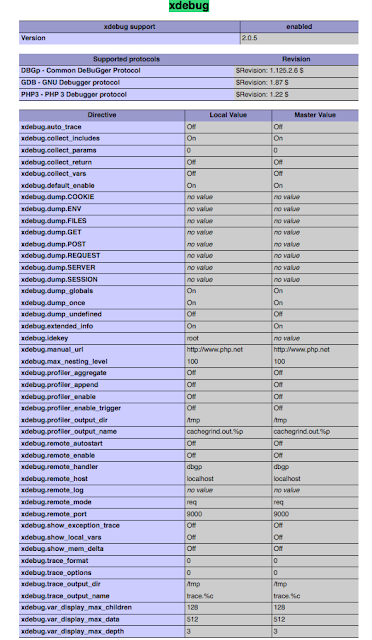 I will show you how to setup PHP debugging using open source software for both command line and web page debugging. Obviously these are instructions just to get you started. 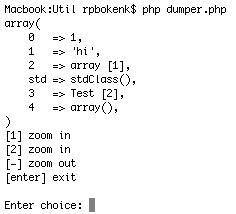 The other debugging module is "Zend Debugger" and other PHP IDE's are available (e.g. Komodo). RawDev will use more of XDebug extended functionality such as profiling. Using this library you can browse the content of complex variables, one nested level at the time by using commands such as zoomin, zoomout and exit. Currently, this class should only be used for command line applications. Web browsable functionality will be added later using through firephp/firebug. By executing the snippet below you will see the following screen. At this point you can decide to exit (or zoomout), or zoom in to nested variable links  and . For command line application development this beats var_dump and will save you a ton of time when debugging.